Comme des Garcons’ pilgrimage to various “incense centers” of the world (Avignon, Ouarzazate, Jaisalmer, and Kyoto) would not have been complete without an Orthodox landmark. The choice fell on Zagorsk, a small town about an hour from Moscow. In fact, this town was known as Zagorsk only during the Soviet times; it has been previously called Posad, Sergiev, and, since 1992, Sergiev Posad. 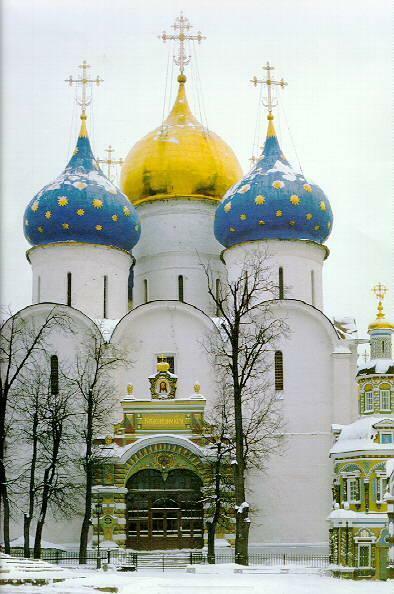 Sergiev Posad is most famous for its spectacular fortress monastery, the Troitse-Sergiyeva Lavra, an important center in the Orthodox world. Zagorsk the fragrance starts with an incense note that is almost immediately joined and somewhat overwhelmed by a woody note that smells to me like birch bark. There is also a slight “nuttiness” to the scent at this point, reminiscent of cedar nuts. Before long, the incense note become stronger and is joined by a pine accord, from then on Zagorsk is the combination of these three notes, birch, incense and pine, to my nose, much like a church standing in the middle of a forest. It is a winter forest, with pine needles lying on the snow and birches standing bare; having said that, I don’t actually perceive Zagorsk as a cold scent, rather, it is crystal-clear, like a frosty but sunny day famously described by Pushkin in a poem cited above. Zagorsk is a quiet, contemplative, melancholy fragrance that, rather predictably, brings to my mind Andrey Rublev’s famous icon, Svyataya Troitsia (Holy Trinity), which was painted by him for the Trinity Cathedral in Posad (it is now kept in The Tretyakov Gallery in Moscow). 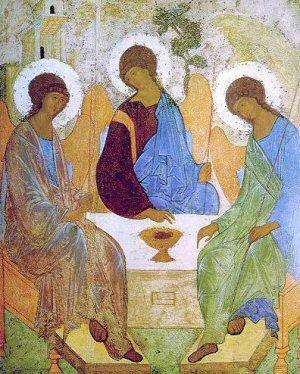 In depicting the Trinity as an indivisible essence without beginning and without end, this much revered image strikes the balance between the soul and the body, the endless and the mortal. With its combination of solid woody notes and ethereal incense ones, Comme des Garcons’ creation seems to have been built upon the same principle of harmony between the corporeal and the spiritual. Zagorsk is available at Luckyscent, $54.00 for 1,7oz. Hi M! One of my (many) goals this fall/winter is to revisit the CdG incense scents. I love incense, but for whatever reason, these did not make a big impression on me the first time I tried them. Beautiful review! Thank you R! I think my favorite CdG Incense scent isKyoto, very reminiscent of Malone Pomegranate Noir and so easy to wear. I also like Zagorsk and Avignon. I was unimpressed with the other two. What a beautiful review dear M! I must re-test this next time I am near their boutique. Evocative review, Marinochka! I love the chilly, crystaline feel of Zagorsk, as it is so rare to find in an incense fragrance. Like you, I was most impressed with Kyoto and Avignon. The other two I vacillate on, which is probably not a good sign. Thank you V! Do you like any of the Incense deries? Thank you Vikochka...what we need is candles in these scents, maybe they are available and just don't know about them? I think that they are candles already. I swear that I saw them, but now I need to double check. Ooooh, I will be looking too, thankyou, V!! Great review, M, and I especially like the inclusion of the poem, since I've not really dived much into Pushkin. I do know I've got a sample of the Kyoto at least sitting around somewhere (sigh, somewhere, I do need to find a filing system for these samples), and need to dig it out now that you mention it's your fave of the series. K, I hesitated to include the poem, it is such a well-know piece in Russia, it is almost a cliche, but I since I am sure it isn't that widely popular abroad, I decided to go forth and include it. If you do like Kyoto, then you shoudl also try Pomegranate Noir, the new Jo Malone scent, they are very similar. I wonder if it smells differently. All I know is that it probably put me off purchasing anything fragnance associated with the post-Soviet space for good...Though your review does sound inviting, so I may make an exception. I really think you are safe here, Nonnochka, Comme des Garcons is such a hip trendy company, they wouldn't make anything as uncool as Societ or Post-Soviet. You have a beautiful site! I love the graphics you are using. I have just started a site about perfume that is more general in nature that might appeal to some of your readers.